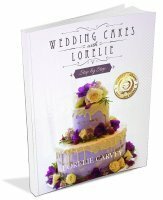 Cake filling recipes from a decadent chocolate mousse recipe to a raspberry mousse extraordinaire. 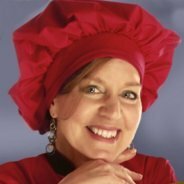 Follow the links on this page to the recipes with tutorials, pictures and descriptions. You may also want to check out the frosting and icing pages. Most of the recipes there double as a filling. 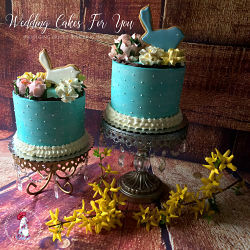 I like to use buttercream flavored in various ways especially with fondant wedding cakes. 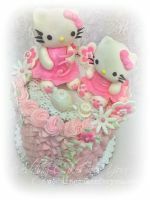 The buttercream consistency and firmness when cold acts as a glue to hold your layers together. 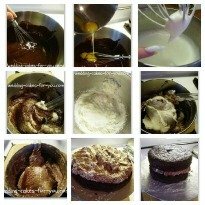 Use the frosting as a dam to hold in the looser cake filling recipes and to "glue your cakes. A dam is a thick piped layer of icing around the inner edge of each layer to form a casing around the filling of a cake. One of my favorites of all cake filling recipes. Sinfully delicious and incredibly easy, try the smooth decadence of this mouthwatering recipe. It can also be used to frost the outside of your cakes too. 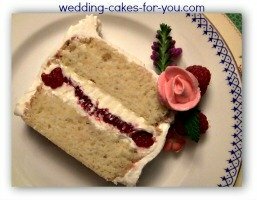 The photo shows the addition of raspberries which goes well with an Orange butter cake. A decadently rich version of the classic chocolate mousse. This one has butter in the recipe which helps to firm it up when cooled. It makes a fantastically delicious wedding cake filling. 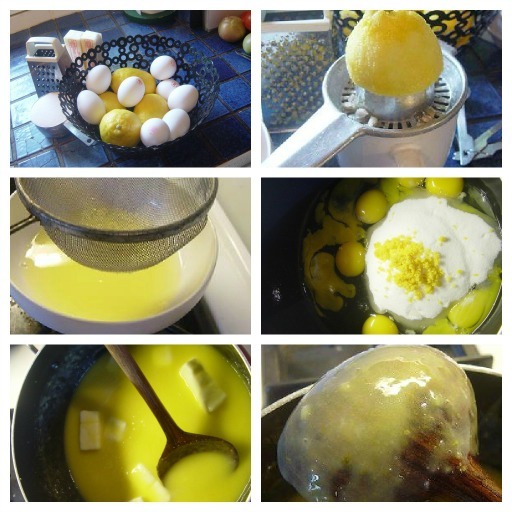 You will find a tutorial with images on the recipe page to help you visualize the process. Chocolate Mousse filling is not difficult to make, but it does require a gentle touch when folding the heavy chocolate butter mixture with the light cream and the whipped egg whites. I prefer an English Lemon Curd for my lemon fillings. Loaded with rich butter and eggs. 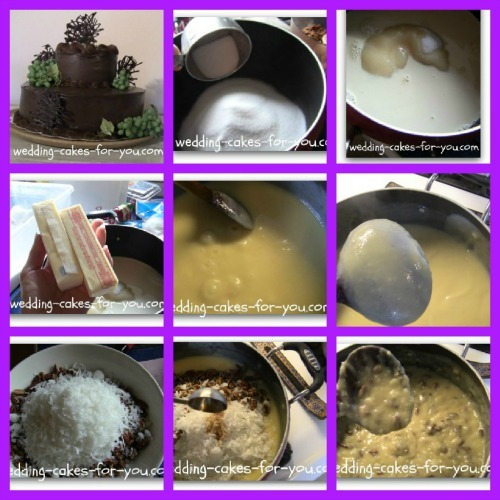 It's incredible as a wedding cake filling and you can use it in so many other ways. NOTE: I highly recommend using the Lemon Curd as a flavoring to buttercream or whipped cream. In fact the curd is risky used alone in a cake. Adding it to the creams makes for a nice fluffy lighter filling then when used all by itself. TIP: Use this as a tart filling or as a special treat on toast or pancakes. 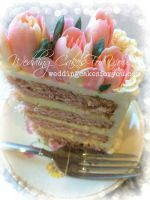 German chocolate filling with coconut and pecans is a superb yet often overlooked wedding cake filling. Chunky and delicious is how I would best describe this yummy addition. Transform any chocolate cake into a German Chocolate one. Pastry Cream is a classic thickened custard used as a wedding cake filling and in pastries. It can be flavored in countless ways or made lighter by adding whipped cream. It's so versatile and delicious. NOTE: Just like the lemon curd recipe above, I recommend mixing and lightening it up with whipped cream. It's also delicious with rum added to it as well as almond flavoring. 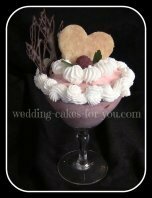 Try the raspberry mousse filling next time you make a summertime wedding cake, or substitute the recipe below with whipped cream, fresh raspberries and raspberry puree mixed in. I have used this combination quite often in the past when i had may brides asking for this flavor. 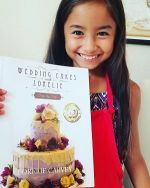 Frosting page is where you will find the chocolate ganache recipe. 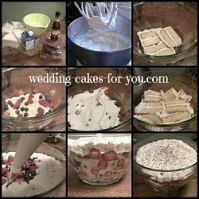 You can use many of the icing recipes as filling.